This Kids Korner article is from GenMin National Coordinator Jeffrey Broadnax. 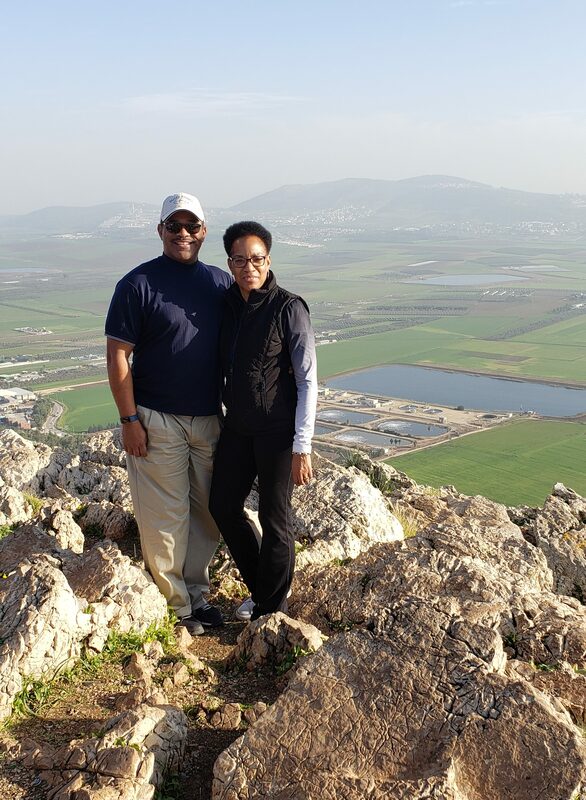 I recently returned from a trip of a lifetime to the Holy Land, where my wife and 18 friends and colleagues walked the in the footsteps of Jesus, Peter, Paul, Mary Magdalene, Abraham, Rahab and many other of our biblical heroes. The most asked question upon my return was, “What was your favorite part?” It’s nearly impossible to answer that question because there were so many great moments to choose from. Was it riding on a first-century style boat on the Sea of Galilee? How about walking down the road of the triumphal entry? What about visiting Magdala, which used to be a blip on my biblical roadmap, but now has such incredible significance as a validation of Scripture? Maybe it was taking communion with my wife and friends in the chapel at the Garden tomb? Or was it standing on the steps at the entrance to the temple, where I know Jesus himself would have stood, taught and walked scores of times? I can’t choose just one favorite part. My 588 pictures each bring a powerful memory to my heart about our tour through the Holy Land. So, I chose to share a few stories of places that touched my heart and enlivened my understanding as a start and let the rest of those experiences unfold as opportunity permits. The more I think about this experience, the more I realize this is what this Equipper column is all about. We want to help parents and ministry leaders become effective “tour guides” of the Christian journey for young people in our sphere of influence. In 2014, the Barna group and the American Bible Society published a study called “The State of the Bible.” One of the interesting items noted was that approximately 43 percent of U.S. adults could name the first five books of the Bible. In a report a year earlier, they found that only half knew that John the Baptist was not one of the 12 apostles. How can this be when from the same study, they found that 88% of American households own a Bible and number of Bibles per household is 3.4? Sounds to me like we need better tour guides helping children, youth and adults navigate the stories, lessons and revelation of the Father, Son and Spirit and their unconditional love for every human being as revealed in the Bible. Where do you begin? If I asked you to tell me your favorite Scripture, your favorite Bible story or the best moment in Scripture, what would you say? I’d like to suggest you begin preparing for that moment like the Israelite families were trained in Deuteronomy 6. After telling them to love the Lord their God with all their heart, soul mind and strength, God challenged them to remember their experiences and journey with him when he said, “These commandments that I give you today are to be on your hearts. Impress them on your children. Talk about them when you sit in the house, when you walk along the road, when you lie down and when you get up” (Deut. 6:6-7). Why does this story or verse stand out in my journey or understanding of Jesus? What does it teach me about his love for me and all mankind? 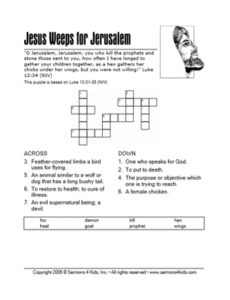 If someone is new to the Bible or a faith walk, how would I use this story to help them see Jesus through fresh eyes? Don’t stop at five. Now move to ten, twenty, thirty. Why not start a small group with children, teens, young adults or those your age each sharing one of your favorite biblical stories as a starting point? By doing so, you will not only deepen the experience, but you will also help others learn to capture snapshots of their journey with God on the heart-to-heart Bible tour and share them with others. By now the tree has been taken down, the boxes and wrappings placed at the curb for garbage day, and the glow of Christmas is fading. What if I told you there is still more for you to give, especially to the young people in your family, congregation and community? In fact, I believe your greatest and most lasting gift has yet to be given. That gift? PRAYER! I have spent the last month praying for a young teenage girl who is in the fight of her life with an eating disorder. I have also spent the last two weeks praying specifically for twelve high school students who recently joined me at our Home Office in Charlotte for a weekend leadership retreat. There is also the teen in my local church performing in the Nutcracker and several boys and girls whose parents are unfortunately going through a divorce. I’ve also been praying for a college athlete who recently lost a friend in a tragic motor vehicle accident and the young person caring for his father’s horse as a way of honoring his memory. There are young people all around me. Not only has God blessed me to be able to see them, but He has challenged me to regularly pray for them. Let me share what I have done and suggest that you do something similar. 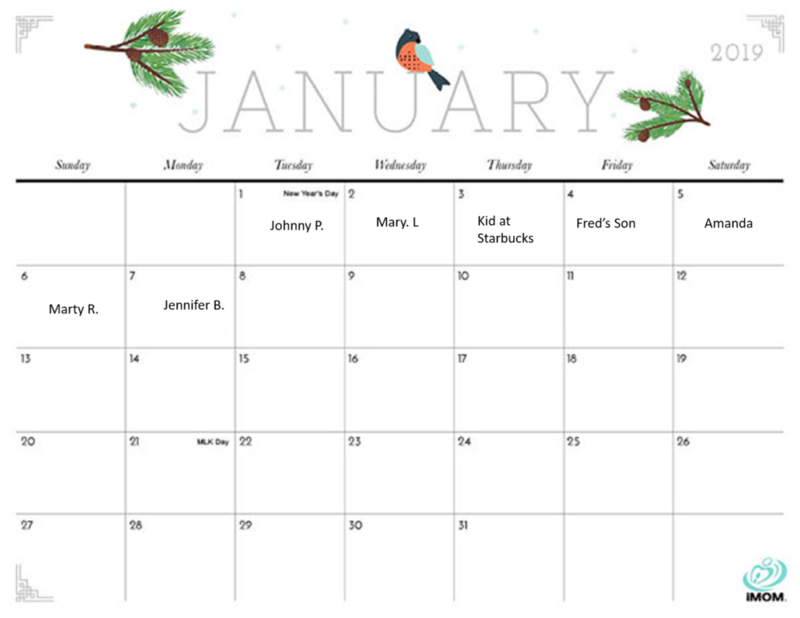 Why not grab a blank calendar or create one on your phone, tablet or computer. Write the name of a young person on each day of the week (see the example below). Some of us will be able to fill two weeks or even a month, while others may only be able fill a week. Then pray for that young person on that day of the month. Oh yeah, don’t forget to pray for the kids’ parents and all the others who will be influencing them. Will you commit to taking a year and praying at least once per month for the young people in your sphere of influence—everyone from your own child, to the kid who helps the ushers collect the offering, to the kid who serves you at Starbucks? Give them a great gift—talk to Jesus about them! This Kids Korner article is from GCI Generations Ministries National Coordinator Jeffrey Broadnax. Most people are open to receiving words of appreciation, small gifts and other acts of kindness at any time of year. But during the seasons of Advent and Christmas, it seems that God uses such acts in a special way to open people’s hearts to Jesus and his love. So, let’s encourage our children and teens to take advantage of this opportunity by being intentional and personal in expressing appreciation to people in their congregation who they know (and even admire). 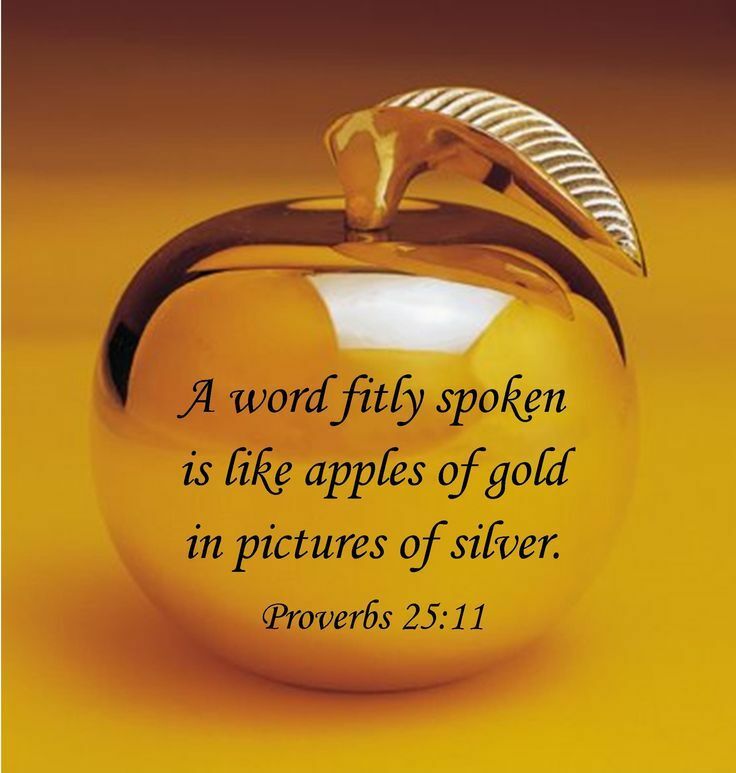 Proverbs 18:21 says that “life and death are in the power of the tongue” and that “those who love it will eat of its fruit.” The Message Bible offers this paraphrase: “Words kill, words give life; they’re either poison or fruit—you choose.” Let’s encourage our kids to bless others during this time of year by choosing to speak heartfelt words of appreciation or by extending genuine compliments. Doing so will give other people hope, a reason to smile, and even strength to make it through a rough day. It’s amazing how much power a few words can have in blessing another person. Two children in the congregation I pastor recently handmade gifts for me. As they handed them to me, they said, “It’s just because you are a great pastor.” Those gifts are now sitting in a prominent location on my desk at home—that’s how much what those kids did means to me. I still smile when I look at their gifts. But that’s not all. What they did makes me want to do something similar for others so they might share in the joy I am feeling. So, I texted a short message to a couple of friends to tell them that I love being their friend. Encourage the kids in their notes to go beyond a mere “thank you” to specify what they are thankful for. I bet those giving and receiving such notes will be chewing on that spiritual fruit for a few days as together they experience the gift of Jesus’ love and joy. Advent and Christmas blessing to you all! Kid’s Korner this month is from GCI Equipper Editor Ted Johnston. We’ll soon begin a new cycle in the Western Christian worship year, which begins with Advent Season (the period that includes the four Sundays prior to Christmas day). This year, December 2 is the first Sunday in Advent, so now is the time to prepare. GCI strongly encourages its congregations to structure worship in accordance with the Christian worship calendar, following the Revised Common Lectionary (RCL). To help congregations do that, we publish here in GCI Equipper RCL-synced sermons for each Sunday and a few other special worship days (such as those during Holy Week in the Spring). Those of you who teach children’s church and teen church and classes can capitalize on this tie-in to the Christian worship calendar by syncing what you teach with the RCL. There are many ways to do that, and I encourage you to use your creativity. To help you, I’ve listed below some RCL-synced curricula available online. None of these are produced by GCI and thus we don’t necessarily endorse all their content, though we see these as some of the best resources available (if you know of others, let us know by posting the information in the comment box, below). Kids Korner: Loving Our Kids to Life! Kid’s Korner this month is from Lance McKinnon. Have you ever heard someone say, “I love my kids to death!”? That statement is not meant literally. Instead, it’s our way of expressing a whole-life focused love. It’s the kind of love we see in Jesus, who went to the cross for the sake of bringing us into the wholeness of his life. The way we approach discipleship with our kids should mirror that love. Let us all aim to love our kids to life! Over the next few months, through a series of articles on worldview conversion and whole-life discipleship, the focus here in Equipper will be helping people of all ages develop a Christ-centered worldview. I urge all of you who are on the front lines of discipling kids to take to heart what is said in these articles so that you can, in turn, help our kids live their lives centered on Christ. Children and teens especially run the risk of drowning as they swim in a “cultural soup” that runs increasingly counter to a Christ-centered worldview. Those who disciple kids must be vigilant in aligning their own worldview with the mind of Christ, so they can then help protect our children from being swept away in the currents of our increasingly “me-centered culture.” As Ted Johnston noted in his worldview article in last month’s Equipper, there is a very strong “me-centered” current in our Western world that shapes the worldview and identity of many people. We would be naïve to think that this current does not taint our approach to youth and children’s ministry. However, it doesn’t have to. As we let the Holy Spirit lead us deeper into the conversion of our own worldview, we can, in turn, find healthier and more effective ways to love our kids to life, rather than to death. We can be a powerful voice in their lives, pointing them to Jesus, the water of life, where true freedom and life-giving identity flows. So, I encourage you to do the hard work of building awareness of the cultural soup we swim in, while developing a Christ-centered worldview that enables our participation with Jesus by the Holy Spirit, in discipleship with our children. I highly recommend reading Ron Highfield’s book (pictured at right), which was recommended by Greg Williams and Ted Johnston in last month’s Equipper. In my opinion, it’s a top read for anyone who wants to be informed and equipped in doing ministry in our culture today. I also encourage you to follow the discussion here in Equipper on this topic. As we move forward together in this direction, we can engage in healthy dialogue leading to better understanding and practice in how we disciple our young people. Author Posted on September 4, 2018 Categories Kid's KornerLeave a comment on Kids Korner: Loving Our Kids to Life! Kid’s Korner this month is from Georgia McKinnon. It’s the time of year when churches may want to offer a “Back-to-School Blessing” event for the kids (children and teens) and teachers in their congregation and target community. If you’ve never held an event like this, you may wonder what one would look like. Or you may be asking why you would want to hold an event like this. The “why” of having a Back-to-School Blessing is directly tied to the “who” question we often ask: “Who is this God we serve?” The answer is that this God is a blessing God—a good God who blesses. He shares his blessing with us and calls on us to share his blessing with others. 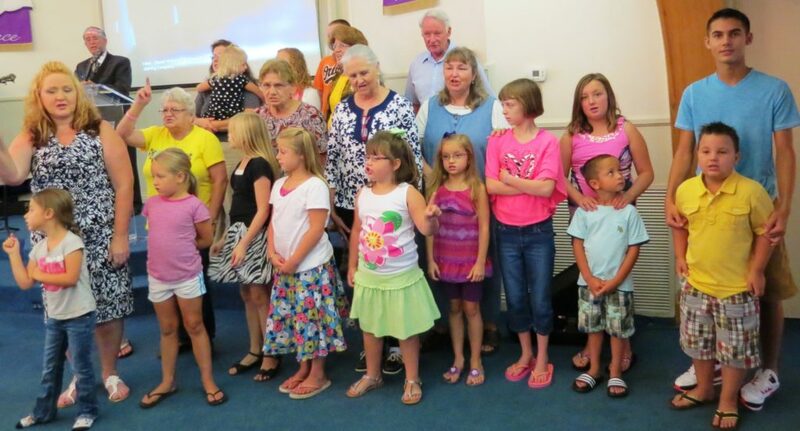 A Back-to-School blessing service in one of GCI’s congregations. Throughout the Bible we see this blessing theme. In the Old Testament, God promises to bless Abram (Abraham) and that in turn he (Abraham) would be a blessing to others, ultimately the whole world (Genesis 12:2). In the New Testament, Paul offers praise to God in Ephesians, acknowledging that Jesus has “blessed us with every spiritual blessing in Christ” (Ephesians 1:3). Paul continues in this passage to list specific things God has done in Jesus as blessings to us. Why? Because he is a blessing God! Since we serve a good God who blesses, we can participate in his blessing work by intentionally finding ways to bless others. In this work of blessing others, we are wrapped up in the loop of blessing that the Triune God shares with us. As we share in his blessing life, we become witnesses to the God who has so richly blessed us in Jesus Christ. The shape of a Back-to-School Blessing event can vary greatly, depending on your context and what you are trying to achieve. It could be as simple as calling all the children and teachers (school teachers and Sunday school teachers) together during a worship service to ask a blessing over them for the upcoming school year. This can be worked into your church service in many ways. It could also be more involved by adding an outreach component leading up to the event, like coordinating a collection and distribution of school supplies to children in need in the community. In both activities, you can invite others in the community to participate, either in the Blessing Service, the service project, or both. There may be additional opportunities in your community that arise as the new school year approaches where the Spirit may be leading you to participate. No matter what shape your event may take, if you choose to have one, a Back-to-School Blessing not only becomes a blessing for others, but it serves as a witness of our blessing God as revealed in Jesus Christ, and the hope we have living in communion with him. Last month’s issue of Equipper highlighted GCI’s newly launched website, GCI Resources. This website provides a wide array of discipling tools, including We Believe. This new publication from GCI provides a comprehensive review of the core beliefs of our Christian faith. There is an edition for adults and older teens, and another for youth (younger teens and older children). 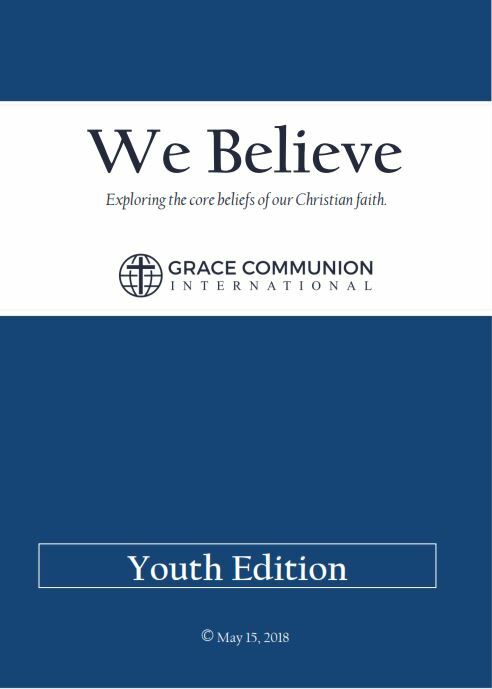 To download a PDF of the youth edition, click here. If you are in a role where you could use some help in walking children through the core beliefs of our Christian faith, I think you will find the youth version of We Believe a welcome tool. The heavy lifting is already done for you by providing a list of questions and answers along with supporting scriptures that illustrate the point. The scriptures provided can be memorized by the students, giving them a strong biblical foundation in their journey. 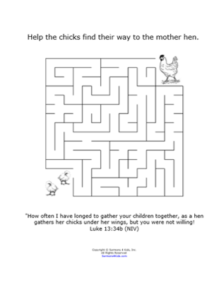 Whether you want to use this tool in a church youth program or if you are looking for a way to lead your own children to a fuller understanding of the Christian faith, We Believe is an easy and accessible tool that allows you the flexibility to set a pace appropriate for your students. Question 3: What makes you a child of God? Grace: God’s gift of love that I do not deserve and cannot earn. Question 27: Is Jesus just another human being? No. Jesus is fully God and fully human. As “Immanuel” (meaning “God with us”), Jesus is God just as the Father and the Holy Spirit are God. Jesus is also human, just as we are. Question 59: Why do we pray to God? Because we were created to live in close relationship with God, who wants to hear from us, his children. Our hearts long for God, for we need God’s presence, help and guidance every day. Many questions like these can give you the confidence that you have exposed your students to the essential beliefs of our faith. I encourage you to take advantage of this resource in your efforts to disciple the children in your care. 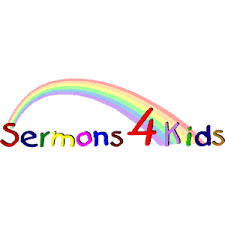 Kid’s Korner: Fun in the Son! Kid’s Korner this month is from Georgia McKinnon, a mom and children’s minister who serves as Registrar at Grace Communion Seminary. It’s almost summertime here in North America, and with the onset of summer comes a flurry of activity for children’s ministry: VBS, pool parties, picnics, summer camps, movie nights, mission activities, and more! Before you know it, it will be time to plan a back-to-school bash! Whew! Summer is a great time to intentionally engage children in ministry—at church and outside of church. But summer planning and activities can also be times of stress and anxiety, especially for smaller congregations, which may have unpredictable attendance. Anxiety creeps in as we ask questions of ourselves and others: Which families will be at church this week? Will there be someone to teach Sunday School? Will there be anyone to attend Sunday School? How do we plan our VBS when everyone is taking their vacation in a different week? Why won’t more volunteers sign up to help? Should I plan more activities, or should I take some off the calendar? Does anybody even care? I don’t even pretend to have solutions to the logistical problems we often face as we participate in ministry. But I know the one who does! He is more interested in us and our children than we could possibly imagine! He is calling us to a deeper trust in him—a deeper reliance on his work in our lives and in the lives of our children and in our congregations. He is working deep within us, in ways that we often cannot see. He is far more concerned about us personally than about the quality of program we are able to pull off or how many people show up at our events. Jesus is not calling us to be anxious. He is calling us to live in his peace. As we do so, we can minister in his strength, knowing that he is doing the work and providing the increase. We don’t need to be worried about too few (or too many!) kids showing up because we know that Jesus will show up! He is already at work, and we are invited to participate! Now that’s having fun in the Son! Author Tech SupportPosted on June 6, 2018 June 6, 2018 Categories Kid's Korner1 Comment on Kid’s Korner: Fun in the Son! This month’s Kid’s Korner is from Equipper Editor Ted Johnston. GenMin. Beginning with the landing page at https://resources.gci.org/genmin, you’ll find information about Generations Ministries, the youth ministry arm of GCI. Information is given about GenMin’s camps, short-term mission trips and leadership development programs. We Believe. At https://resources.gci.org/we-believe you’ll find information about GCI’s newest tool for discipling adults and kids. We Believe provides a comprehensive review of the core beliefs of our Christian faith. There is a version for teaching older teens and adults, and another version for teaching younger teens and older children is coming soon. Check it out! Age-graded resources. 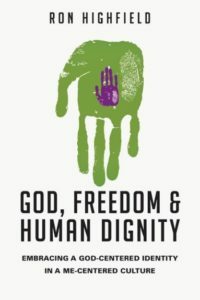 At https://resources.gci.org/age-graded-resources you’ll find resources (books, articles, websites, curricula and events) useful for discipling people of all ages, including children and teens. You’ll find many other resources related to disciple-making on the GCI Resources website. We hope you find them helpful in your ministries to kids and to people of all ages.